The Best Selection of Organic, Local and Prepared Foods in Taos! 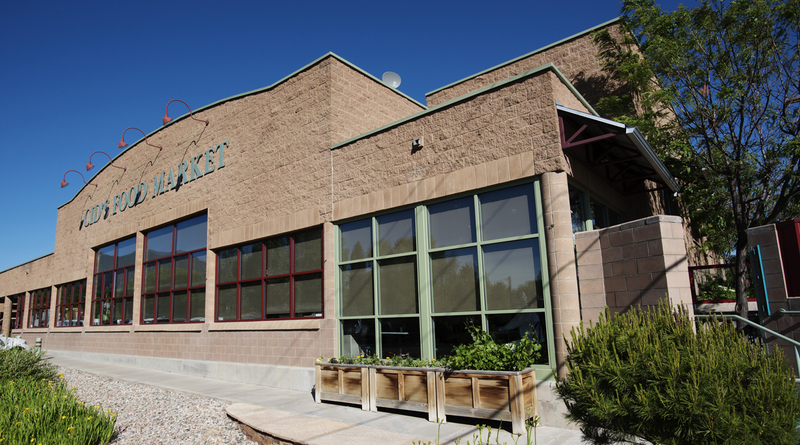 Cid’s Food Market has the largest selection of natural, organic, gourmet, and local products in Taos County. We assess the ingredients and quality of all our products and work to provide foods free from artificial flavors, colors, and preservatives. Cid’s follows these guidelines throughout each department of the store, and provides an organic produce department, a full service meat counter featuring animals raised without antibiotics, growth hormones, or animal byproducts, and a health and beauty department full of vitamins, supplements, herbs, and body care products free from harmful additives. Cid’s has the widest selection of quality organic and local fruits, vegetables, and herbs in Taos County. Working with farmers in northern New Mexico and southern Colorado, Cid’s brings you an outstanding selection of local products. 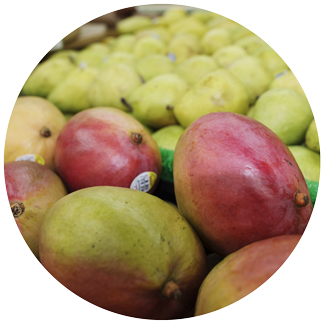 Check out the Cid’s blog for updates on seasonal fruits and vegetables. Cid’s has an incredible selection of naturally raised meats and fresh seafood. We have local, grass-fed beef, and natural chicken, pork, buffalo, and lamb, raised on a vegetarian diet in humane conditions. 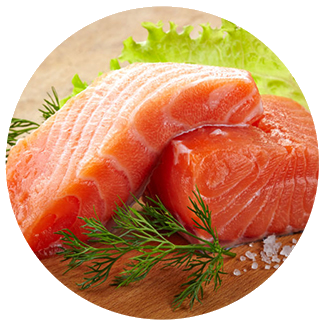 We have the freshest seafood selection in the area including wild salmon, shrimp, and much more. For your personal health needs, you can find a wide array of vitamins and supplements, as well as homeopathic and aromatherapy products. 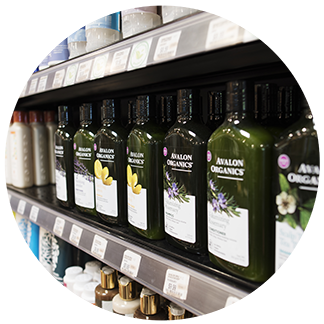 Cid’s offers an incredible selection of natural and organic lotions, shampoos, conditioners, soaps, sunblocks, and other beauty aids. You will also find makeup that is ethically produced and contains natural ingredients. Cid’s carries a wide range of natural and organic refrigerated and frozen products. 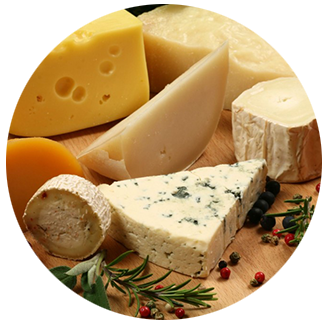 We have the best selection of cheeses in Taos, ranging from locally-made goat cheeses to Manchego from Spain. You can find organic cheeses, yogurts, milk, and a selection of locally produced eggs. 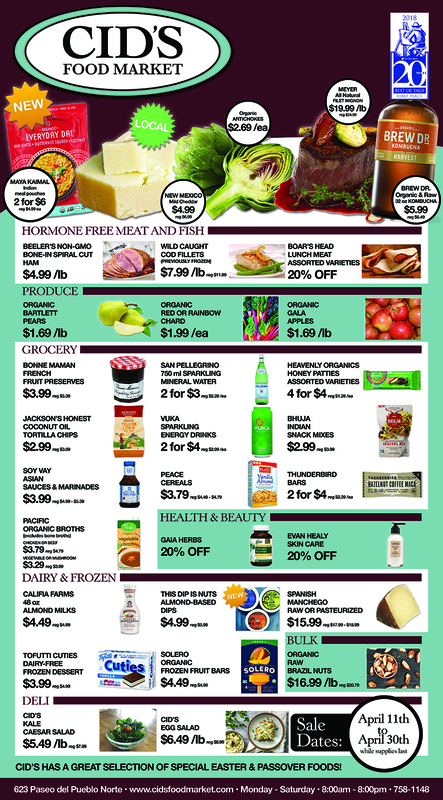 We also carry non-dairy milks, cheeses, and yogurts. In our freezers, we carry a tasty assortment of frozen entrees, vegetables, fruits, and desserts. We have a wide selection of gluten-free and meatless entrees as well. For New Mexico flavors, we carry frozen green chili and locally-made tamales. We have an amazing selection of ice cream, including non-dairy frozen desserts. 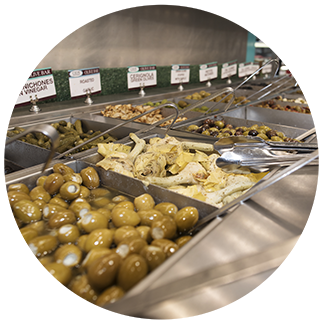 Located near our frozen food section, Cid’s self-service olive bar has an extensive selection of olives and other antipasto. 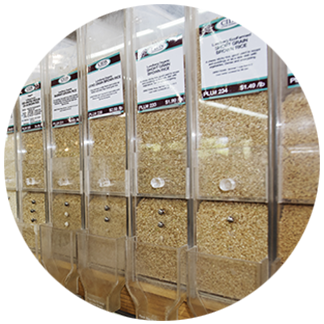 Cid’s has an extensive selection of bulk foods, including whole-grain flours, nuts, pastas, rice, trail-mixes, granolas, and candy. If you are interested in finding the highest quality organic foods for an outstanding price, be sure to check out the bulk section at Cid’s. 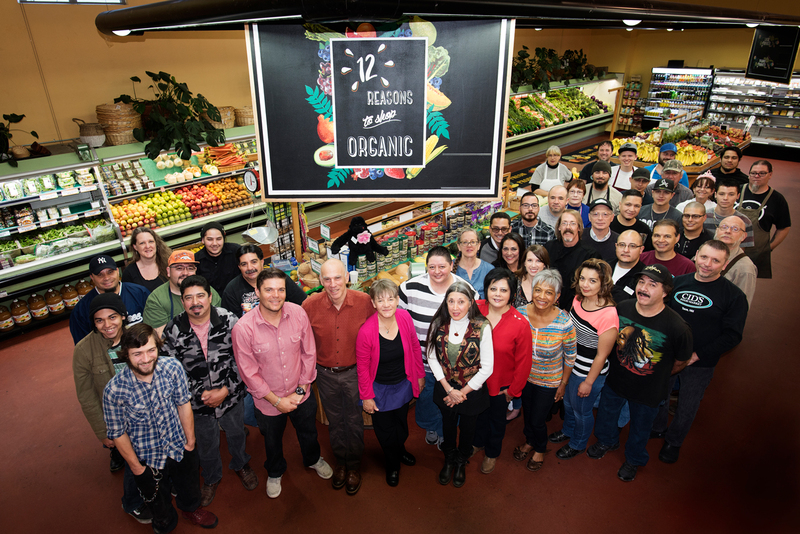 Cid’s Food Market has been providing northern New Mexico organic, local, natural, and gourmet groceries since 1986. At Cid’s Food Market you will find quality foods alongside outstanding customer service. From a simple hello and thank you, to special orders and custom meat cuts, we pride our-selves on having the best customer service you will find anywhere. Cid’s has been repeatedly recognized by the Taos News People’s Choice Awards as being the best grocery store, having the best produce, having the best customer service, and being the best green business in Taos County. Cid’s Food Market is a family owned business that puts people before profits. Cid’s employees earn liveable wages and receive generous benefits. We pride ourselves on creating a healthy and happy work environment for our staff. The store is also strongly committed to the Taos community, through its nonprofit donations and support for local businesses. Recognizing their commitment to community, the Taos News recognized Cid and Betty Backer as the 2008 Citizens of the Year. For your party or special event, let us do the cooking. For events big or small, formal or casual, business or fun — carry-out catering from Cid’s Food Market is the easy way to enjoy your favorite prepared dishes from Cid’s. We can prepare everything from party trays, sandwiches, salads, sushi and dips, to a variety of main courses like our delicious enchiladas or Indian cuisine. We accommodate special diet requests and will work with you to put together a menu for any event. Call 757.758.7231 or email us. Bring your own bags when you shop at Cid’s and get tokens to deposit towards local nonprofits. Using your own bags is environmentally friendly and helps to make a difference. In 2016, Cid’s donated over $20,000 to the non-profits listed below. Since the Bag Program has started, over $130,000 has been given to community organizations in Taos. So bring your own bags, save some trees, and strive for a better tomorrow at Cid’s Food Market, Taos’s only locally owned supermarket. © 2017 Cid's Food Market| All Rights Reserved.